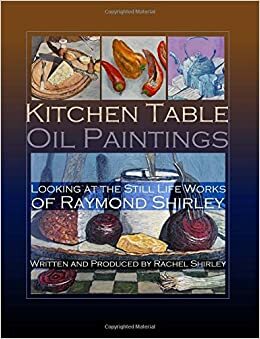 This is a book about still life painting as seen through the eyes of artist Raymond Shirley. Find beautiful oil paintings of tabletop settings featuring food and associated receptacles. Everyday objects are portrayed in the style of the early French and Dutch still life masters, but as can be seen, Raymond has evolved his own style over the decades, capturing the attention of major art galleries such as the Mall, the Royal Academy and the Paris Salon. Most of the paintings within feature humble settings: a table, a chair or a workbench. Less is more, like the titles conceived. We feel the artist is telling us something, and it is really quite straightforward. However, the execution is anything but. The result is a book that rejoices in oil painting and food. The aim is simple: to make us see the most familiar of settings in new and different ways. A jar of pickles will never seem the same. Learn about the tools, techniques and practices employed, along with a short biography about the artist. An overview on the paintings can also be found at the back. An invaluable resource for aspiring still life artists as well as for those who love looking at paintings. Dimensions: 8.5x11” 94 pages. With numerous colour reproductions.